As far as nature photography goes, I've sequestered myself to my garden for a bit. I've taken hundreds of photos out there so far this season so everytime I walk out there now, I think "thats it, I've shot it all". The truth though is that I haven't shot anything yet. 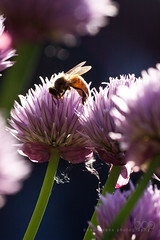 I've taken lots of pretty flower photos and I've nailed a few frames that I'm proud of, like this photo of a honey bee harvesting nectar from a chive blossom, but I feel that I've yet to produce something unlike anything you might see in any other talented garden photographer's portfolio. Those apps can be really handy. But I don't think it's a great deal to find goods photo editors for Windows phone like magickeffectsphoto.com. I've had some major problems finding them for my Mac, so now I share them kindly. Sean Scolnick aka "Langhorne Slim"